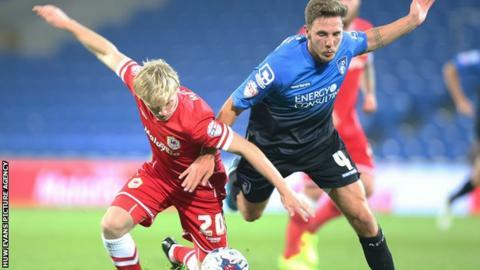 Dan Gosling maintained his Capital One Cup goalscoring run with two goals as Bournemouth knocked out managerless Cardiff City. Gosling, who scored in the previous two rounds, gave his side the lead with an effort from the edge of the area. Charlie Daniels added a second with a clinical finish before Gosling compounded Cardiff's misery with a tap-in. Bournemouth are in the fourth round for the first time in 51 years. It was a miserable evening for joint caretaker managers Scott Young and Danny Gabbidon, who was one of eight changes in the Cardiff starting line-up. Marc Pugh had gone close for the visitors before Gosling opened the scoring two minutes later with his third goal in six games. The former Newcastle United player coasted through the Cardiff defence before cutting in from the right and firing a low drive beyond keeper Simon Moore. Bournemouth were firmly in control and they extended their lead when Daniels completed a sweeping move with a clinical finish. Things went from bad to worse for the home side when Gosling scored his second, tapping in the loose ball after Moore had saved Brett Pitman's curling effort. Cardiff mustered late first-half chances with Nicky Maynard going close and substitute Federico Macheda firing over but they left the field at the interval to a chorus of boos. The Bluebirds showed improvement after the break but were struggling to make an impact and a Macheda header was ruled offside. Juan Cala headed wide from Adam Le Fondre's corner and Tom Adeyemi shot over the crossbar while Harry Arter struck the crossbar for an impressive Bournemouth. Gabbidon twice had to clear off his own line late in the game on a forgettable evening for the 2012 League Cup finalists, who are searching for a new manager following Ole Gunnar Solskjaer's departure. "We can't start a game with eight or nine players like we did here. That was the reason why we had to make changes and take people off. We were 3-0 down and needed to be brave. "There were a few choice words at half time but that wasn't acceptable for this football club. "When you wear that shirt you have to wear it with pride and the minimum requirement is to work hard and have the will to want to do it." "The performance was right out of the top drawer and the players were excellent, it has been a very good day for us. "We beat a very good side comprehensively and that will give us a real confidence boost. "The quality of our football was great to watch, even from my perspective I enjoyed watching it. You hope it can go as well as that when you plan a game. "Everything we wanted to do we did. And I thought we were equally as good without the ball, we were compact and restricted them to a few chances." Match ends, Cardiff City 0, Bournemouth 3. Second Half ends, Cardiff City 0, Bournemouth 3. Corner, Cardiff City. Conceded by Brett Pitman. Attempt blocked. Federico Macheda (Cardiff City) right footed shot from the left side of the box is blocked. Corner, Cardiff City. Conceded by Eunan O'Kane. Attempt blocked. Anthony Pilkington (Cardiff City) right footed shot from outside the box is blocked. Corner, Cardiff City. Conceded by Tommy Elphick. Substitution, Bournemouth. Simon Francis replaces Adam Smith. Attempt blocked. Junior Stanislas (Bournemouth) right footed shot from the centre of the box is blocked. Attempt saved. Harry Arter (Bournemouth) right footed shot from the right side of the six yard box is saved in the centre of the goal. Substitution, Cardiff City. Anthony Pilkington replaces Nicky Maynard. Attempt missed. Brett Pitman (Bournemouth) right footed shot from the right side of the box is close, but misses to the left. Harry Arter (Bournemouth) hits the bar with a right footed shot from long range on the left. Attempt missed. Harry Arter (Bournemouth) left footed shot from outside the box is close, but misses to the left. Corner, Bournemouth. Conceded by Declan John. Substitution, Bournemouth. Harry Arter replaces Shaun MacDonald. Attempt missed. Tom Adeyemi (Cardiff City) right footed shot from more than 35 yards is high and wide to the right. Nicky Maynard (Cardiff City) wins a free kick in the defensive half. Corner, Bournemouth. Conceded by Cala. Corner, Bournemouth. Conceded by Federico Macheda. Foul by Nicky Maynard (Cardiff City).